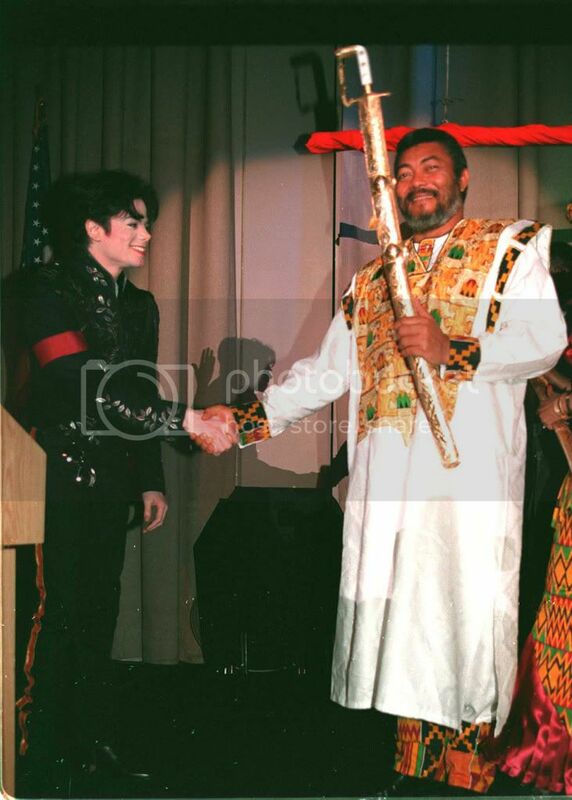 1995 – Michael Jackson receives the Diamond of Africa award from Ghana’s President, Jerry Rawlings during a dinner at the Hotel Hilton in Beverly Hills, California. The evening's highlight was the appearance of pop legend Michael Jackson who postponed a trip to Europe to make certain he was at the event. "I'm supposed to be in Germany, but I postponed it to be here," Michael told the President and First Lady. "I was advised of your presence and I found out about your mission to rebuild Africa. I couldn't resist. I love Africa... You are not alone." Michael present the first couple with two elegantly decorated swords on behalf of Saudi Arabian Prince Al-Waleed bin Talal. According to the dinner's organizer, Dr. Khalid Abdullah Tariq AlMansour, the swords were designed "to cut out devision, insecurity, hypocrisy and negativism. Rise and Unite! Africa is back." President Rawlings said of Michael to the sellout, black-tie crowd: "I never thought I'd have the honor and privilege of meeting the genius in person. To meet him on a day like this is an honor. What impressed me most is that he's a man of heart." The President and first lady expressed their gratitude to Michael by presenting him with the elegant Diamond of Africa, To a Favorite Son of Africa Michael Jackson, offered by "That's What Friends Are For Committee". 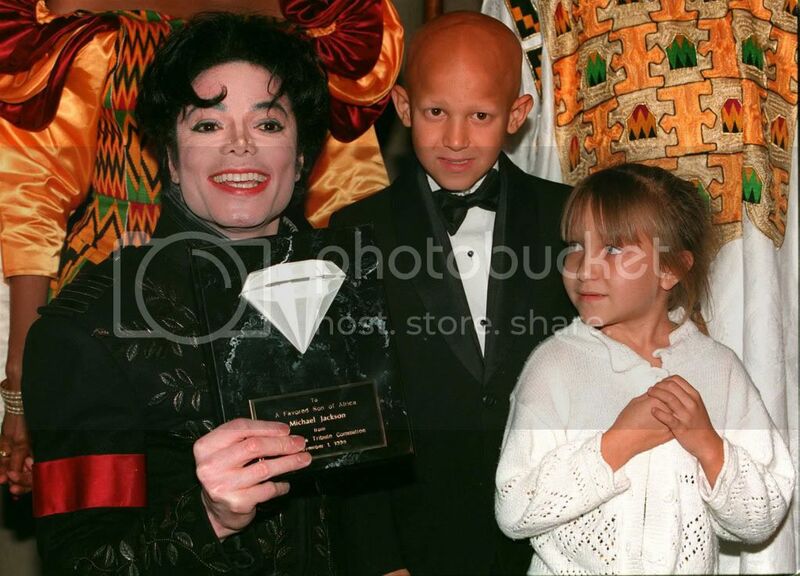 On accepting the honor, Michael acknowledges a few children that joined him on stage, among whom cancer-stricken ones. 2002 - Jackson is presented with the 2002 "World Arts Award" in Vienna, Austria, for global peace and tolerance efforts. The award recognizes individuals for achievements in a variety of areas such as acting, arts, business, media, health etc. The singer accepts the award via a video message. 1979 - The Jacksons perform Destiny tour in Chicago, Illinois. 1984 - The Jacksons perform Victory tour at Orange Bowl in Miami, Florida, USA attending 68,000 fans. The following acceptance speech for the 'World Arts Award 2002' he wins that year, on occasion of the first World Awards event held in Vienna, Austria, the singer conveying his empathy with the event’s values of peace and tolerance, as well as those of love and unity for an improved planet. "Dear guest of honor. Dear Mr. Gorbachev. It is a great honor for me to be selected by Mr. Gorbachev and the jury to receive the 'World Arts Award 2002'. This year the motto of the World Awards is 'Peace and Tolerance'. These values are especially dear to me. In my own heart and mind I stand united with you for peace, love and tolerance in the world. I have to thank Mr. Günther Stampf, Mr. Georg Kindel and I thank President Mikhail Gorbachev. I love you very much. Thank you so much. Thank you. ", Jackson says in the speech. This entry was posted on 02 November 2010 at Tuesday, November 02, 2010 and is filed under 1972, 1979, 1984, 1995, 2002 . You can follow any responses to this entry through the comments feed .